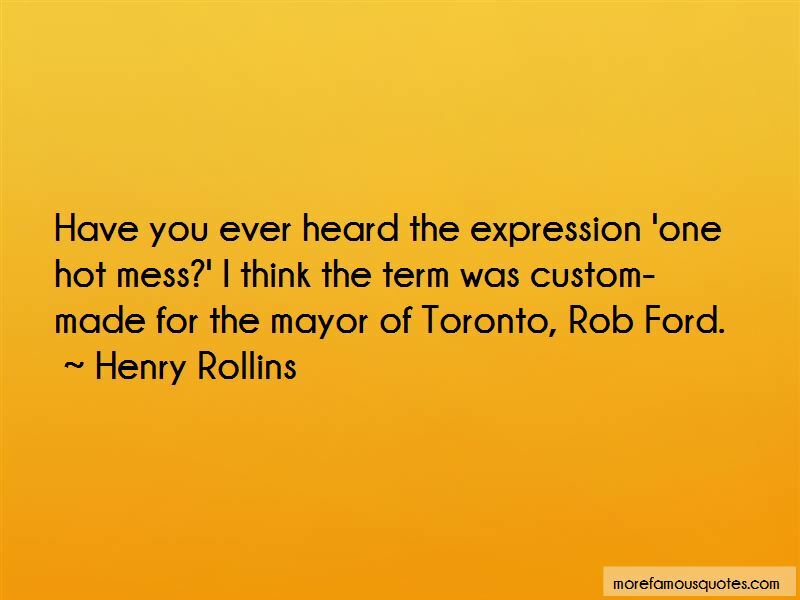 Enjoy reading and share 34 famous quotes about Hot Mess with everyone. “It was ironic, really - you want to die because you can't be bothered to go on living - but then you're expected to get all energetic and move furniture and stand on chairs and hoist ropes and do complicated knots and attach things to other things and kick stools from under you and mess around with hot baths and razor blades and extension cords and electrical appliances and weedkiller. Suicide was a complicated, demanding business, often involving visits to hardware shops. “I didn't mean to mess things up, I don't know what got into me-"
He rubs his temples. "Please don't apologize.It's not your fault." "But if I hadn't dragged you out to dance-"
"Anna." Etienne speaks slowly. "You didn't make me do anything I didn't want to do." My face grows hot as the knowledge explodes inside of me like dynamite. “We said a week, right?" Saint asks me. "A week for ... " I'm confused for a moment, but then I remember our conversation onboard The Toy, about him ... and me. And I know exactly what he means. "Oh, that." A hot flush creeps along my body, spreading down, down, down, all the way to my toes. "Yes, that's what we said," I admit. "How about now?" he surprises me by saying. Tingles and lightning bolts race through my bloodstream. The sensation covers my body from corner to corner. I try to suppress it; it's wrong to feel it. But I can't stop it, I can't stop what he does to me. "What happened to your legendary patience?" "How about now, Rachel?" he insists. All my guilt, my insecurities, and my fear are suddenly weighing down on me. It's really hard to speak as I shake my head in the dark. "I'm a mess, Saint," I choke out. “Laura looked up at him with dead blue eyes. I want to be alive again," she said. "Not in this half-life. I want to be really alive. I want to feel my heart pumping in my chest again. I want to feel blood moving through me - hot, and salty, and real. It's weird, you don't think you can feel it, the blood, but believe me, when it stops flowing, you'll know." She rubbed her eyes, smudging her face with red from the mess on her hands. “I'm not ill like that," she groaned. He sat on her bed, peeling back the blanket. A servant entered, frowning at the mess on the floor, and shouted for help. "I,uh ... " Her face was so hot she thought it would melt onto the floor. Oh you idiot. "My monthly cycles finally came back!" “I thought wulfen howls were bad when I heard them in my own garage. Hearing the high, glassy cry in the middle of the woods at night is infinitely worse, because the howls sounds like it could be words if you just listen hard enough. The horrible thing is that it pulls on that deep hidden part in every person-the blind animal part. The part that knows you're the prey. “He wouldn't spend another standing in the darkness, hot and sick and shaking inside with a confused mess of feelings that weren't worth analyzing. That he shouldn't have felt anyway. With Rachel gone it was like balancing on the edge of a cliff-and all the little wildflowers, the netting of grass and roots that kept the cliff from sliding into the sea below, were gone. It was just Matt standing there looking down, waiting to fall. Even Rachel's memory, the sweet recollection of all they had built, all they had shared, was no longer strong enough to fight gravity. From the moment he had looked across the wet grass and seen Nathan Doyle standing in the shadow of a stone saber-toothed tiger, something had changed inside him. Something battened down had torn free, like a sail taking its first deep breath of sea air. And at the same time it exhilarated him. Want to see more pictures of Hot Mess quotes? 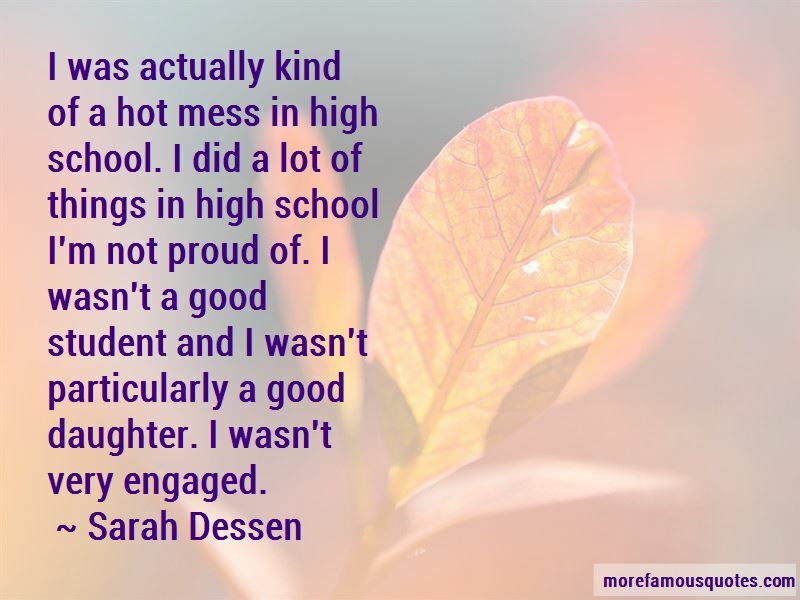 Click on image of Hot Mess quotes to view full size.